As I have tried to prove over the two years I have been keeping this blog, vegetarians have an incredibly varied and interesting diet. It is not all brown rice, tempeh, and tahini sauce. But sometimes that combo – especially when you have come home from vacation and are craving clean and healthy food – is really good. This creation is a riff on a delicious dish that I orginally found on 101 Cookbooks. When I first found it two years ago, I made it many times all through asparagus season. Then I did the same last year. This time, I changed it up. I wanted more protein than the chickpeas could give me, so I baked up some tempeh in a marinade and added that. I omitted the nuts and changed the cooking method slightly. Several weeks ago, I found an amazing tahini sauce at the Whidbey Island farmers market and I used it instead of the homemade that Heidi suggests. (Hers is delicious and easy, by the way.) I had spring onions and green garlic from our CSA so I used those and I added some red pepper flakes for heat. The result was something I could probably eat everyday, if I was not trying to debunk the theory that all we vegetarians eat is things like this. Tempeh is a little polarizing – there are plenty of vegetarians who don’t like it. If you are one of those, I implore you to try it this way. I found this method in one of my most-loved cookbooks The Voluptuous Vegan. You first steam the tempeh (which you should always do to remove the bitter taste), then you mix together a sweet and savory marinade starring apple juice and soy sauce, then you add the tempeh. It will look like too much liquid, but let that tempeh bake in the oven and it will absorb it all and even develop a bit of a crust. So good. I am going to try tempeh this way next time as a kind of crouton in a main course salad. I always eat all the croutons out of my salad anyway, they may as well be healthy. 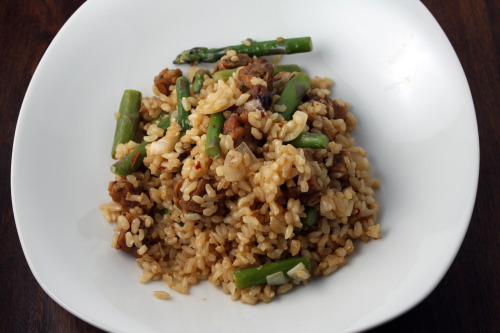 I love this dish enough to continue making it even after asparagus are gone from the markets. It would be great with green beans and I’ve even thought of adding edamame. Meat lovers in Ohio, give it a try! The sauce I used is called Mr. Mobley’s Tahini Sauce and is available in various locations around Seattle. You can order it online here. Or just use the sauce from Heidi’s original recipe. Peanut sauce would be great here too. Place the tempeh in a steamer over boiling water for 10 minutes. Meanwhile, prepare the marinade. Whisk the apple juice, soy sauce, vinegar, oil, mirin, and chile paste in a glass pie dish. Add tempeh and toss to coat. Allow it to marinate for 20 minutes. Heat a large skillet over medium heat. Drizzle in just enough olive oil to coat the bottom, then add the onion and a large pinch of salt. Cook until softened, about 6 minutes, then add the garlic and chile flakes. 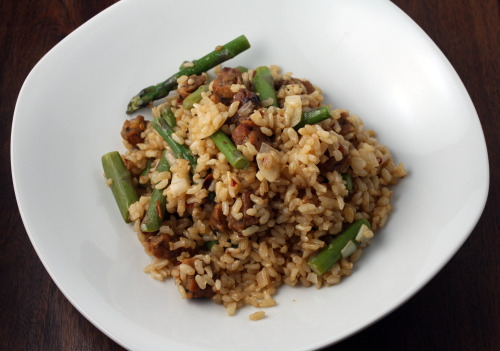 Cook, stirring constantly, for 2 minutes, then add the rice, tempeh and asparagus. Continue to cook, stirring carefully all the while, until the rice is heated through. Add enough tempeh sauce to coat the grains and salt and pepper to taste. Thank you, Dana, for including my sauce with your recipes on your website. If you make food to support wheat and glute free diets, please direct them to my site as well. My sauces also come in Wheat and Gluten Free varieties. Even being a meat lover. I have a definite sweet spot for tahini sauce (I actually just posted a vegetarian recipe that uses it also!) and tempeh. I’m really passionate about tempeh. This looks like a recipe I would definitely love. i love, love, love tempeh! this dish looks fantastic, and you know what? my husband, who is also a meat eater, would definitely like this dish. I have to tell you we’ve been having a ‘serious’ kind of vegetarian week. 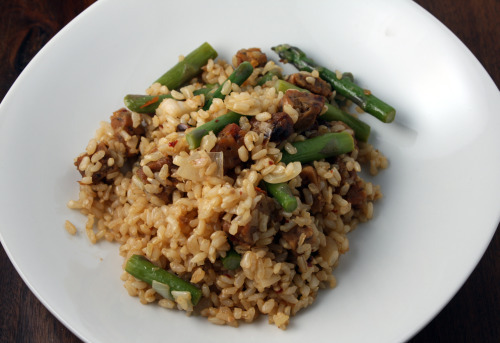 There have been brown rice, bulgur wheat, and lots and lots of green vegetables on our plates. It’s been delicious! I don’t why, but I’ve never used tempeh. Now, I’m inspired to try it exactly as you describe preparing it here. Looks delicious. I have not had the best luck with tempeh, I will admit. I am happy to have some tips for it! I will try this soon, as those are all flavors I love. Thanks! But, I think you’re wrong about what meat eaters think of us- the ones I know wouldn’t even think of the rice/tempeh. I mainly get incredulous looks and lines like “What? You ONLY eat vegetables?” Apparently in some circles, “vegetarian” is taken quite literally! We LOVE tempeh at our house, and we’re not even vegetarians :) That said, one of the reasons why I love your blog is that it shows how incredibly lovely (and varied and nutritious and delicious) vegetarian food can be. Although we still eat meat, our diet has benefited from the diversity that comes from eating plenty of vegetables and alternative proteins… and your blog is one of the inspirations! OMG this looks so great! I was a vegetarian for about 10 years. Two of my kids still are. I’m always on the lookout for delicious recipes that we can cook when they come home. This is going on the menu. BTW, ready for some sun??? Last night I grilled veggies (zucchini, asparagus, red onion, shiitake mushrooms). Then I grilled flatbread and put the veggies on that with parmesan and walnut dressing (from May’s Food & Wine issue). It was SO GOOD. I was telling Eric than anyone who thinks vegetarian food is boring has got to be nuts. He said, not nuts just hasn’t had good vegetarian. Anyway, we are both vegetarian lovers even though we eat meat about twice a week. There are so many vegetables and flavors to try. I don’t know how it could ever get boring. Looks lovely, Dana! While I was a vegetarian for a good 14 years, I’ve been eating meat for around 2 years now although I’m surprised at how often I really base my day around a vegetarian diet–satisfying and varied, just like you mention. This recipe, in particular, looks fabulous and I haven’t cooked tempeh in quite sometime so looking forward to giving it a whirl. That steam-the-tempeh-first tip is pure gold! I picked it up somewhere else on the interweb recently — can’t remember where — and it makes a world of difference. As much as vegetarians eating tempeh is a cliche, I could use more tempeh recipes. Edamame would be a great addition! I love dishes like this. I tried tempeh for the first time and did not enjoy it… Maybe it was the way I cooked it (steamed then in a sweet and sour sauce with vegetables) but I just couldn’t get over the flavour!